•a wide choice of colours. 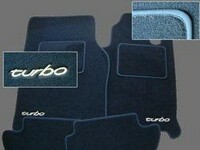 We have been supplying custom made sets of car floor mats in any colour, with matching or contrasting edging, to specifically suit any car, for a number of years. They're British made from high quality deep pile carpet, foam backed, tough and durable. You can customize them to suit your own car - colours, logo etc. 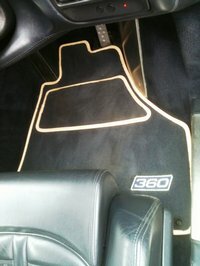 A set comprises 2 or 4 mats depending on your car. Our MD has been using a set of these mats since 2007, and has covered 5,000 miles per year - the mats are still in superb condition. Note: we will assume any logo you request is embroidered white on the outside edge of the driver mat as illustrated unless informed otherwise. Copyright logos cannot be added, but model numbers, like 355, DB7, 360 are suggested. Delivery is up to around 7 working days. Note: these will always show on the website as 'In stock' but due to their custom nature allow for manufacture.